Justice can be an elusive concept. What is just in one culture may be unjust, or even barbaric, in another culture. Some of you may want to see the big picture, instead of being whipped into a frenzy by the inflammatory rhetoric of your own culture. Some of you may want to experiment with being free of the narrow view of the culture or cultures of which you are a part. But one thing is certain: You cannot know if you are free of your culture’s own faults if you refuse to question your own culture. There are parts of the world where beheading people is an acceptable, perhaps even popular, means of expressing that Justice has been done. The visual impression is most stunning, in that the beheaded offender will never, ever, offend the culture again. The offender is dead and without a head. The offender is no more dead than if they were shot, hanged, or executed by drugs, but the image is stronger. And therefore, the publicity is more influential. The Western media are now aware that some Islamic cultures consider the western media to be offenders against their culture. Hence, executions by beheading. Not surprisingly, the media close ranks and condescendingly present the spectacles as barbarism. Those doing the beheading consider themselves just, and servants of justice. What is ignored is the trans-cultural acceptance of beheading. Examples are abundant. The Queen in Alice in Wonderland, beheadings during the French Revolution, occasional mountains of skulls depicted in Hollywood movies, and, of course, King David taking Goliath’s head after David killed him. I even found coloring books with David holding Goliath’s head aloft. So I won’t tell you what to believe. But being shocked at beheadings is somewhat naive. I doubt we will solve the riddle as a whole. But we will be better off if we are not shocked into a mental stampede by those who are the most effective at spreading the news of terror. Why I am bothered by beheadings is that the Scriptures infers this at the last days. While this was a certainty in Medieval times, torture of horrible kinds, just reed Fox’s Book of Martyrs, but I an responding to t his,because I believe we may be seeing what revelations spoke of with respect to beheadings, we ahve not seen this on the WW PLATFORM, with respect to mans inhumanity to man, we ahve no place as a nation to point fingers, just look at the many races of Indians that were decimated in 30 years by disease, raids, shootings, and the idea that Indians were sub-human. like shooting a dog. Lou, I tend to agree with you. I don’t think Goliath or John the Baptist enjoyed it. 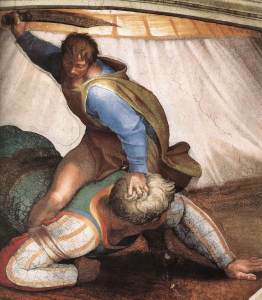 Do you suppose the army of Israel under King Saul celebrated the beheading of Goliath? What point do you suppose David was making? Good points, it is easy to react to what we see in haste. I heard that Goliath’s head was buried near Jerusalem, possibly at Golgotha, ” The Place of a Skull”. I’m not sure where this information originates; has anyone else heard about this? I have never heard anything about where Goliath’s head is buried.